The story has all the elements for a crackerjack Coen brothers thriller: It starts with a burly, goateed biker called "Scooter" and his pure-bred English mastiffs, Max and Brandi. The day after Thanksgiving, Scooter reports Max and Brandi stolen -- taken, he says, by a pair of devious lovebirds who loaded his gentle giants into a pickup truck and fled to Arizona. Frantic, Scooter takes to the Internet, posting his story on dog-related message boards and searching for leads on the alleged perpetrators. Shortly before Christmas he learns their location: Prescott, Ariz. He rallies one of his biker buddies, and the two men head to Arizona in a rental car, ready for a showdown. Scooter aims to bring his big dogs home. But things may not be quite what they seem. The alleged dog thieves -- a female drag racer from Fortuna and her Arizona boyfriend, a self-professed killer who's had plenty of run-ins with the law -- offer up a different story. They've been falsely accused, they say: It's Scooter's girlfriend Robin who's the real criminal. Turns out Robin's awaiting trial in Shasta County on charges of fraud, embezzlement and criminal conspiracy. DA's office says she's lookin' at 10 years in the clink. 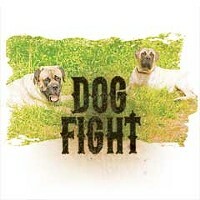 The suspected canine bandits say they're actually in cahoots with the prosecution. They'd been gathering evidence against Robin on the sly, they say, but were discovered by Scooter and had to flee for their lives. According to the lovebirds, this dog theft story was cooked up by Scooter in an attempt to smear their names. When Scooter and his cohort arrive in the high deserts of Arizona, they stake out the suspects' house, hoping to catch a glimpse of Max and Brandi. Those pooches are family to Scooter, and he's not gonna give up the search ’til he's got ’em back. Through the Internet, he's rallied a crack team of allies, including a woman from Phoenix who trains explosive-detecting dogs for the war in Afghanistan. On a covert recon mission, the dog trainer and her colleague snoop around a suspected dog hideout, and sure enough, the friend spots a dog matching Brandi's description. They notify the fuzz. As Scooter and the police get closer and closer to cracking the case, the drag racer and her Arizona boyfriend decide to fight back. Before long, what seemed like a simple case of theft has spiraled into a madcap caper full of colorful characters, courtroom drama, car chases, a pregnant jailbird -- even the mafia. It's not a Coen brothers movie, though. This is the real story of Max and Brandi. Among the artisans who've supplied the Treasure Trove with wares is 35-year-old Fortuna native Shelby Allen, a drag racer and animal lover who's been selling her metal sculptures at Moberg's store for roughly three years. One day in early November, Reed and Moberg got a telephone call from Allen. She was in Arizona but was coming back to Humboldt County and needed a place to hide. Her ex-boyfriend was stalking her, she said. So she asked if she and her new boyfriend, Arizona native Dan Sadowsky, could stay at their Loleta property for a while. "I told her, 'Sure, Shelby, you can stay,'" Reed told the Journal last week. He and Moberg didn't have to think twice about it. They'd known Allen for years and considered her to be honest and hard-working. So they put her and Sadowsky up in an RV on their property, and for a while everything was fine. On the morning of Friday, Nov. 27, Reed walked up to the barn to feed the horses like he did every morning, with Max and Brandi lumbering after. 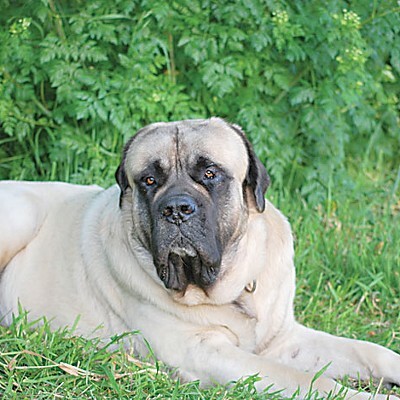 Max, Reed said, is the mellow 2-year-old, a 220-pound softie whose best friend is the cat. "He loves little birds and little bugs," Reed said. They were training him to be a therapy dog. "The only thing that makes him happier than kids is more kids." Brandi -- age, 1, weight, about 110 -- is "more feisty but a real sweetheart." She often crawled on top of Max to take a nap. "He's her mattress," Reed said. "Hi Robin and Scooter, please have Robin's attorney contact [Shasta County] Deputy [District] Attorney Erin Dervin. I have been assisting the state in Robin's prosecution, and I don't think I feel comfortable in speaking with you or Scooter anymore. Your threats and intimidation mean nothing to me. Look forward to testifying in court." Sadowsky says he and Allen are the real victims: They didn't steal the dogs, and they weren't on the lam when they left for Arizona. The trouble really began, he says, with a full septic tank. The RV they'd been staying in had started to stink of human waste, he recently told the Journal from his home in Arizona. When they asked Moberg if they could drive it to a nearby dumping site, she said no. According to Sadowsky, she told him that the RV was stolen and law enforcement was on the lookout for it. After doing some digging, Sadowsky and Allen learned the following: Moberg used to own an RV dealership in Anderson called R&R RV Sales. In April 2009, she and three former employees were charged with bilking their customers -- many of whom were senior citizens -- out of an estimated $300,000. They're accused of taking more than 80 trailers, fifth-wheels and RVs to sell on consignment and then failing to pay the owners when the vehicles sold. Moberg has a tentative trial date of April 27 and could be looking at more than 10 years in prison, according to Shasta County Deputy District Attorney Erin Dervin. Reed and Moberg are serial scam artists, Sadowsky said. Even their supposed nonprofit is a sham, he alleged. Moberg denies those allegations, telling the Journal that she was exploited by the RV dealership's true owners, who used up her inheritance money and then vanished, leaving her holding the bag. Sadowsky said he and Allen spoke with Dervin and started gathering evidence to assist in the case. There were six or seven RVs on the Loleta property, he said, "so we started taking photos of the stolen vehicles and documenting VIN [vehicle identification] numbers." This covert snooping came to an abrupt end, he said, when he and Allen came back to the RV one day and discovered that all the evidence they'd been gathering, including their camera's memory card and all their notations, had vanished. They knew then, Sadowsky said, that the jig was up. Their cooperation with the law had been exposed, and who knew how Moberg and Reed would retaliate. "Shelby and I believed our lives were in potential danger," Sadowsky said, and that's why they left so suddenly for Arizona. Well, that and the fact that Allen was pregnant with Sadowsky's child. It's a high-risk pregnancy, he said, and Arizona has better health care. The alleged dog theft is merely a "canard," he said -- a story made up by Moberg and Reed to discredit their testimony or intimidate them into not testifying at all. This imbroglio is hardly Sadowsky's first foray into high-intrigue melodrama -- to hear him tell it, anyway. A couple years back, he said, an ex-girlfriend stabbed him in the forehead with a steak knife while he was sleeping. He's had neurological problems ever since. In 1994, he claims, he shot and killed a gang member, but it was self-defense. Afterwards, he was kidnapped by a mafioso named Hank Lugo, who took his orders from mafia boss Robert Vincent Cruz, Sadowsky said. Lugo was later decapitated, and Cruz mysteriously vanished. His body was found 10 years later, buried eight feet underground. "I've never been charged with those crimes," Sadowsky said suggestively, "but, yeah, I definitely have a past." When pressed on the matter, Sadowsky denied any involvement in the deaths of the mafia men. Portions of his story check out. In May 2007, the body of a mob associate named Robert Charles Cruz was found wrapped in a blue tarp and carpeting, eight-and-a-half feet deep at a construction site near Chicago. According to the Chicago Tribune, Cruz spent 14 years on death row in Arizona for allegedly hiring three men to kill a Phoenix businessman and his mother-in-law in 1980. The conviction was overturned in 1994, and Cruz had been missing since Dec. 4, 1997. The Journal found nothing to connect these events with Sadowsky. So what does Sadowsky think happened to Max and Brandi? "I don't exactly know," he said. "Maybe [Moberg] sold the dogs. Maybe she still has the dogs. I have no idea. Or another theory I have is ... they could have been eaten by a bear. They could have run off. They could have been eaten by a mountain lion." When the Journal contacted Shasta County Deputy DA Erin Dervin last week, she said the case against Moberg is strong, but not because of any help from Allen and Sadowsky. They called her office, she said, but only after they'd been accused of taking the dogs. "They've never been interviewed, they're not witnesses [and] I don't intend to ever call them as witnesses," Dervin said. Allen is now in jail; Sadowsky is not. Here's how it happened. The day of Max and Brandi's disappearance, Reed was distraught. He called the sheriff's office and reported the dogs stolen -- by Allen. At that point, Reed and Moberg knew Sadowsky only as "Dan from Arizona." Moberg's 24-year-old son, Geoff, later told officers that he'd seen Brandi, the female mastiff, in the white F350 as Allen and Sadowsky drove away on Nov. 27. The sheriff's office began to work on a warrant for Allen. Reed spent the next 48 hours on the Internet, he said, posting his tale of Max and Brandi's disappearance and searching for information on "Dan from Arizona." Eventually he checked Allen's MySpace page, he said, and among her friends found Dan Sadowsky of Peoria, Ariz. He updated the story online, and before long he got a tip from a concerned friend of Allen's: Prior to coming to Humboldt County, Allen and Sadowsky had been arrested by border patrol in Yuma, Ariz., for marijuana possession. Through this information, Reed was able to track down Sadowsky's current address. "Mr. Reed did a lot of work," said Brenda Godsey, public information officer for the Humboldt County Sheriff's Office. "He called one of our officers and said he believes the dogs are in Prescott, Ariz." The HCSO began communicating with the Prescott Police Department, which sent officers out to the property, but they didn't find the dogs. As Reed continued his online investigation, he started getting responses from concerned dog-lovers in Arizona. One such message came from Trisha Harper, owner of K-9 Security Services, LLC, in Phoenix. Harper had just returned from Afghanistan, where she was training dogs to detect roadside bombs, when she got a call from an acquaintance who'd read the story of Max and Brandi. Harper called Reed and offered her assistance. Reed told her he'd used an online service to get a list of addresses for Sadowsky, one of which was in Prescott Valley, 20 minutes from Prescott. (He would later learn that Sadowsky used to live in the neighborhood.) "I was heading up that direction anyway," Harper told the Journal last week, "so I thought I'd stop by." On Dec. 2 she and a former employee went to Prescott Valley. Pretending to peruse a nearby house for sale, the two women eyeballed the neighborhood. They walked through an alley behind the back fence line. "She's taller than I am," Harper said of her friend, "so she saw over the fence." In the backyard of a former Sadowsky neighbor, her friend saw a female mastiff with a purple collar, exactly matching the description of Brandi, Harper said. "We drove straight over to the Prescott Valley Police Department," she said. "An officer followed up the next day. He reported back to us that the people had left." 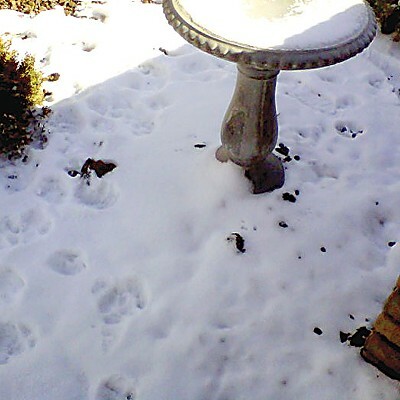 Harper later went to Sadowsky's Prescott address, where she found more evidence -- mastiff-sized footprints in the snow. She snapped some photos and delivered them to the Prescott PD. As the days turned into weeks, Reed grew increasingly frustrated with his remote search, so he decided to go to Arizona himself. In mid-December he rented a car, picked up one of his biker buddies and made the long drive to Prescott. Upon arrival, he went straight to the Prescott Police Department to explain why he was there, he said. They told him they were aware of the case but couldn't make an arrest unless Allen or the dogs were seen inside Sadowsky's house, Reed said. So he parked on a hill above the house and waited. There was at least one other reported sighting -- this time of both Max and Brandi. It came from Sadowsky's Prescott neighbors, an older couple named Carl and Rosemary Carlson. "I saw ’em," Rosemary Carlson told the Journal last week. "I petted them. My husband saw ’em too." She said both dogs were in Sadowsky's backyard a couple days after Thanksgiving, and that Sadowsky even introduced the mastiffs by name. "He called them Max and Brandi [and] he said he was gonna sell the puppies to make money," Carlson said. She added that Sadowsky told her that they took the dogs from someone, but justified the theft by saying the owner had swindled seniors out of thousands of dollars. "But that doesn't give anybody a right to take anything." In the roughly two weeks Reed spent in Arizona, he had several heated interactions with Sadowsky and Allen. Allen reportedly called 911 to complain that Reed was stalking them, then fled next door to the Carlson home. When police arrived, they instead interrogated Allen and Sadowsky about the missing dogs. 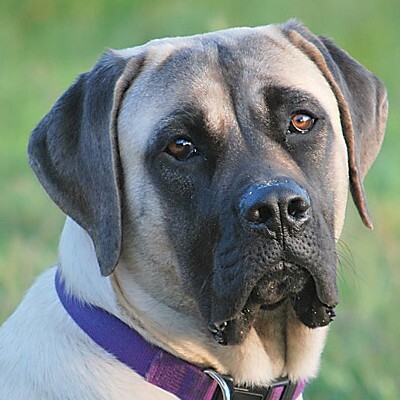 (With Sadowsky present, Rosemary Carlson told police officers she'd never seen the mastiffs. She later recanted that testimony with a notarized letter and, in her conversation with the Journal, said Sadowsky has since thrown a brick into their backyard and threatened to kill her husband.) There was also a vehicle pursuit on the freeway, with Reed and his friend tailing Allen and Sadowsky. Both parties later accused the other of making threatening gestures and driving erratically. Finally, on Dec. 26, Prescott police arrested Shelby Allen. Ten weeks pregnant, she was placed in Camp Verde Jail, an hour east of Prescott. Last week she was extradited back to Humboldt County. 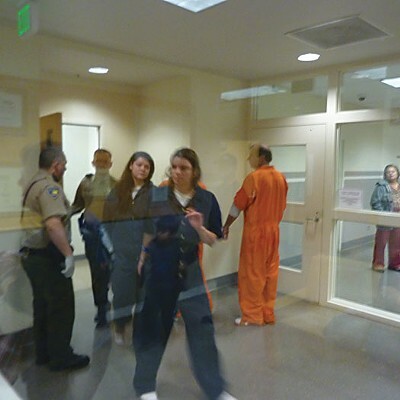 In the wood-paneled confines of courtroom two in the Humboldt County Courthouse last Wednesday, Shelby Allen sat in the juror's box, handcuffed at the wrist to another female prisoner. On either side sat several linked pairs of male prisoners in bright orange jumpsuits. Allen, in a short-sleeve navy blue jumpsuit, her hair slightly matted and shoulders hunched, stared blankly across the room toward those who'd gathered for the hearings. Her mother, Janis Allen, was there, as were Reed and Moberg. When the judge called her name, she stood. No, she told him, she didn't have a lawyer. Yes, she would like one. No, she can't afford one. After quietly conferring with her public defender, Allen pleaded not guilty to violating California Penal Code section 487(e) -- felony grand theft of a dog (or dogs). As the bailiff led her from the courtroom through a glass hallway, she spotted her mom, and her eyes lit up. She smiled and, with her free hand, waived. "My daughter's an animal lover," Janis Allen said after the hearing. "She'd never take anybody's dog." All she knew of Sadowsky, she said, was that he'd been treating his daughter well. Clearly shaken, Janis Allen scanned the windowless walls of the courthouse hallway, looking for a way out. Once outside, she said that things haven't been all bad for Shelby. The previous evening, a nurse had been to see her in jail. "She got to hear her baby's heartbeat yesterday for the first time!" Thursday was the bail hearing. Allen's public defender argued that she should be released on her own recognizance since she had no criminal record. The prosecuting attorney objected, saying she clearly had connections in Arizona and appeared to be setting up a new life there. The judge denied Allen's release and set bail at $25,000. Her next court date is schedule for Jan. 21. This time through the glass hallway, Allen was in tears. Her mother emerged from the courtroom, also crying. Reed and Moberg watched silently as Allen's mom walked past them, through a pair of glass doors and down the hallway. As of early this week, Max and Brandi remain missing, and Sadowsky remains free in Arizona. While Reed and Moberg believe Allen deserves to be in jail, they don't feel that justice has been fully served. Before she met Sadowsky, they said, Allen always seemed like a nice person -- creative, kind, hard-working. It just didn't seem likely that stealing their dogs was her idea. "I think it was him," Moberg said. Reed agreed.